This stitch I avoided for quite awhile when I was learning to embroider. I thought it was too slow and didn't understand how to handle it so it looked reasonable. There was a period I didn't even like how it looked. I just didn't want to do it. But somewhere my attitude change, I was suddenly interested in thread painting, which uses long and short stitch extensively. I got a couple books about thread painting and gave it a try. The shading is subtle and felt overwhelming, but I got the hang of the stitch and how to handle the threads, and I enjoyed the projects I made. The mechanics I learned from the thread painting, and the stitch found it's way into some projects but I never felt especially comfortable or good at it. Today, I am starting again to seek out projects that use it in order to step outside my comfort zone and hopefully improve. So what's the best way to approach this stitch? There are two key things to keep in mind. 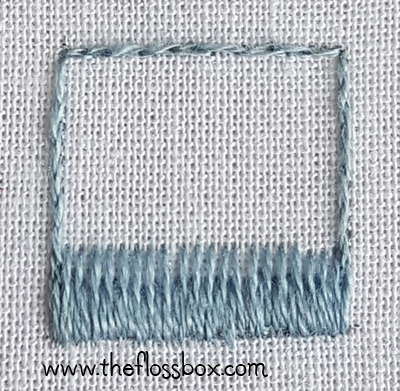 First, it's just a series of straight stitches that need to be lined up in a varied manner, and second, the stitches are easiest to handle when worked in rows over the area to be filled. 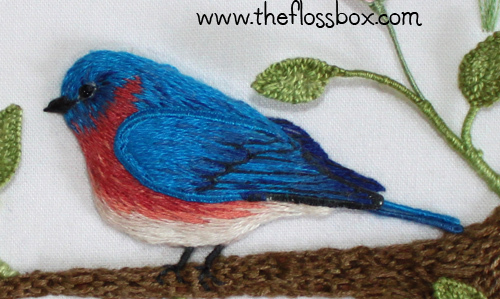 Many crewel and thread painting instructions first say to outline the stitched area with split stitch. This is a good habit as a gives a nice edge to the work, but it's not absolutely required, and there may be places where you prefer that it isn't there. Next start with the first row. Remember to vary the end points of the stitch. The stitches are very regular and as uniform as I could manage. Make another row the same way, and so on until the area is stitched. A couple of final notes, this sample is done with one strand of embroidery floss like many thread painting projects, but you can use as many as you like. It will change the look, but more on this later in the series. This is only a sample, my stitches in my projects are never so nicely arranged as this, ao this later as well.